Lures were made of wood and bone lashed together with flax fibre. 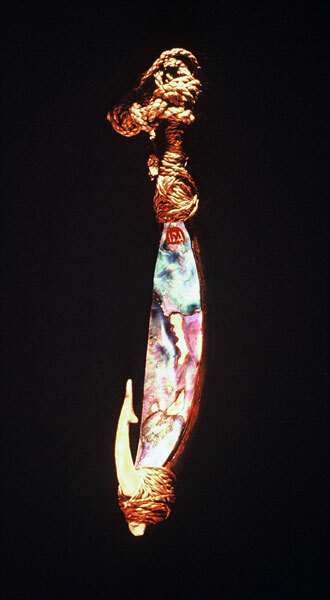 Some, like this one, were inlaid with pāua shell, which attracted fish. Māori would troll the lures, which needed no bait. When a school of kahawai was spotted, a canoe would be launched and paddled at full speed through the shoal, pulling a dozen lures. Larger baited hooks were used to attract bigger fish and sharks.